KRASNAYA POLYANA, Russia -- There were of course dreams. There are always dreams. At numerous points in the past 18 years, Mikaela Shiffrin undoubtedly closed her eyes and tried to picture what the moment would be like when she finally stepped into the starting gate for her first Olympic run. But even when she let her imagination wander, it's doubtful she ever pictured what she experienced Tuesday when that dream finally came to be in the giant slalom at the Rosa Khutor Alpine Center. Fluffy flakes at the top of the 4,340-foot course, pouring rain at the bottom. A murky layer of fog sandwiched in the middle. Snow conditions that changed at seemingly every gate. Thick and powdery up top, something resembling a snow cone at the bottom, without the sugar-filled cherry syrup. And, at each turn along the way, a plume of slush shooting out behind each pair of skis. It would not have been unfair to call this the women's giant slalom in Olympic water skiing. It was a day for experience and patience, a day for those who had been here and faced this before, not for a fresh-faced teenager who loves the television show "Glee." But as always, Shiffrin was unfazed. When her two runs were complete, she found herself in fifth place, a half-second behind Slovenia's Tina Maze. After the race, with a mix of rain and sleet pelting off her ski cap, she spun the experience as only the ultra-positive teenager could. Mikaela Shiffrin finished fifth overall in her Olympic debut, missing a medal by just 0.23 of a second. "It was a pretty spectacular day, actually," she said. "It's not sunny, but on the other hand, who gets to race in their first Olympics in rain this bad when there is still snow on the ground, right?" Um, sure. Right. In the grand scheme of these Olympics, what the Americans accomplished Tuesday will largely go unnoticed. Shiffrin finished fifth, Resi Stiegler was 29th, Megan McJames was 30th and Julia Mancuso skied off the course. There was no hardware for the U.S. to take home, no reason to head down the mountain for a special appearance on NBC. But it may very well be one of the most important moments of the Games for the U.S. team. Its 18-year-old prodigy handled the biggest challenge of her young career with unflappable ease. Shiffrin came into the giant slalom ranked sixth in the world. The four women who finished ahead of her average 206 starts on the FIS World Cup tour. Before Tuesday, they had won a combined 13 Olympic medals, including five golds. Shiffrin has 47 career World Cup starts, and the giant slalom is more of a shiny new toy than her marquee event. "It must be hard [to be just 18]," Tuesday's gold medalist, Tina Maze, said. "I don't know. For that age, she is great. She is amazing." Shiffrin completed her first run in a fifth-best time of 1:18.79, 0.91 of a second behind Maze. 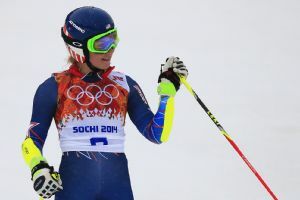 When asked what she needed to do to move up into medal contention in her second run, she bluntly stated, "Ski faster?" She then admitted she didn't even notice the rain. In her second run, her time of 1:18.58 was the sixth-fastest of the field, yet still enough to hold on to fifth place overall. Shiffrin again downplayed the elements, mentioning that she regularly skied in such conditions at Burke Mountain Academy. "It's pretty much all I can remember from Vermont, which isn't fair because there were a lot of nice days," she said. "But you only remember the worst days." Shiffrin said that when she stood in the starting gate before her second run, she had just one thought on her mind: gold. But after clipping her skis on a couple of turns, it wasn't meant to be. A small mistake here, a small mistake there, and the gold-medal dream had died. A few minutes later, she seemed to have little trouble accepting that fact. "I wanted a gold, but I also think this was meant to happen," she said. "It's something to learn from, and the next Olympics, I'm sure not getting fifth." Her father was similarly accepting. "She did awesome," Jeff Shiffrin said. "This is not what she prepped for. It takes a ton of experience to really kill this, and she skied well." The 18-year-old's next challenge will come Friday, when she deals with the weight of expectations in the slalom. Shiffrin is the defending world champion in the event and currently the No. 1-ranked woman in the world. Maze confessed that Shiffrin's performance in the GS will only help the teenager's confidence come Friday. Her father found another silver lining: His daughter won't have to deal with the 24-hour media crush that accompanies winning a medal. "This sets her up better," he said. "There are no distractions." Such distractions will be welcome come Friday. And if and when something magical happens, you get the feeling that the levelheaded 18-year-old will again be ready. For anything.